And with all this cream and butter, Monica surely had to be the dairymaid! I hope that doesn't seem too cheesy? The Monica Richard Amery gave me is at the left, and my latest cream Monika is on the right. The Rheinmetall with the Monika Richard Amery gave me. I'm feeling now it would be a bit greedy of me to hold on to both Monicas. That Rheinmetall is to die for! What a beautiful color; I don't think I've seen another. I have a KsT too and I agree that the keys are not very comfortable; I find that I need far too much strength to operate mine if I hope to write legibly. 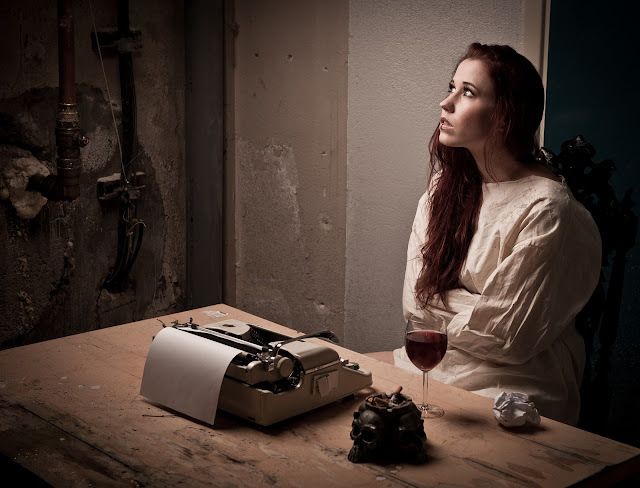 she looks more like a mental patient looking out the window than a blocked writer. This was by far the richest and most fattening post you've ever written. Hello! I have that exact same Rheinmetall. It was my Grandmother's typewriter and I use it occasionally for journalling in my scrapbook/photo albums. I was trying to find out how old it is and came across your blog. Would you have any idea about that? Hi Sleepydwarf. 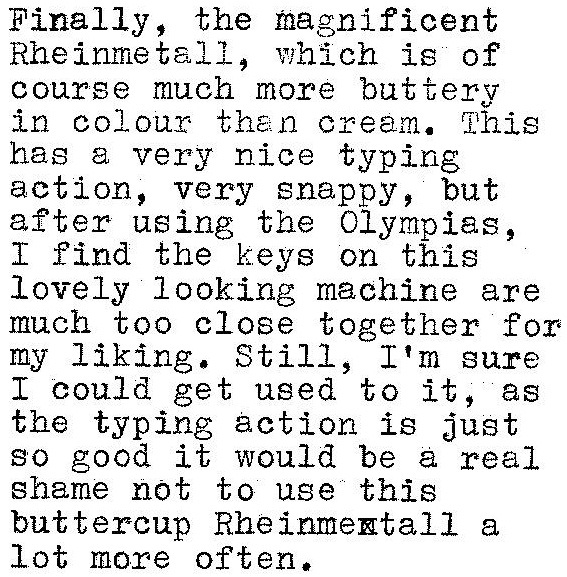 My cream Rheinmetall has the serial number of 555582, which means it was made between 1959-1960. It appears the last of the KsT models was made in 1962. I am going to be doing a full post on the Rheinmetall portables shortly. Oh cool thanks, mine is 560661 so it must be a little bit later than yours. 560301 is given as the first number for 1960, so your Rheinmetall was probably made right at the start of production for that year, I guess.